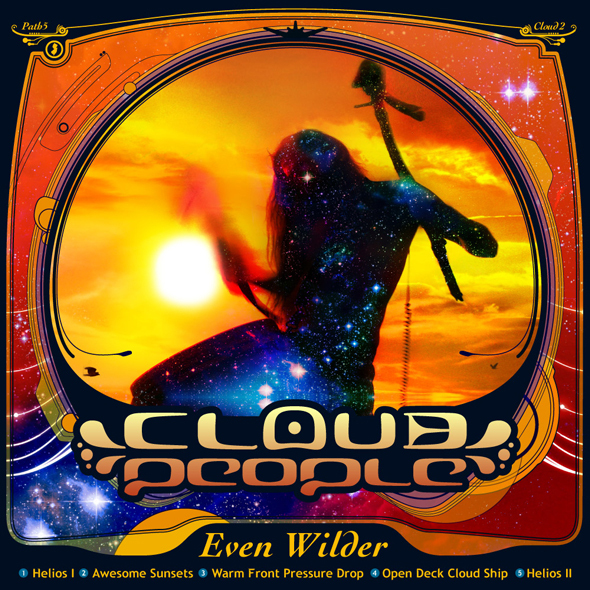 Cloud People Even Wilder, Cloud 2, digital (Batona PATH5). Five new tracks of Pineland-style IDM dub psyche-out sky tunes: released Friday, August 26, 2011. Even Wilder, the only place to go after A Wild Feeling, was released August 26th on Batona Music cloud-wide on iTunes and Amazon. The pace is picked-up and suffused with 5 tracks Pine Barrens heat: rankin' bass heavy dance tracks like "Warm Front Pressure Drop" follow the fading hot vespertine glow of "Awesome Sunsets" before the hurricane gusts and surges of "Open Deck Cloud Ship"'s wild yelps, crashing drum breaks and bits delay across the stratosphere. "Helios I" and "Helios II" set out to join the pantheon of efforts in homage to our star system through spacey synth arpeggios and bluejay calls, to further transuniversal acculturation amongst the surface dwellers. MP3s are be available on iTunes and Amazon and FLAC will be made available via this site and on Batona.com. Cover art by Nice Looking Designs and T. Charles.